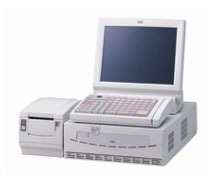 The Toshiba ST-71 is at the leading edge of compact, robust and integrated design with a low total cost of ownership. It is based on the world renowned ST-60 with the same open architecture as the proven ST-7000 series. The ST-71 is equipped with a high performance processor and Front Side Bus (FSB) accelerating the response time, while its high capacity memory of up to 2 GB reduces paging. These features help to minimise bottlenecks, resulting in improved customer throughput, reduced queues and potentially lower labour costs. The robust and rugged ST-71 has been designed for the most demanding hospitality and retail environments. Neither dirt nor foreign bodies can bypass the rubber seal between the touchscreen and front panel. The ST-71 is compatible with current Microsoft Windows. High speed, flexible POS terminal, designed with the power and flexibility to meet the needs of both the retail and hospitality sectors. The ST-60-C5 from TOSHIBA TEC is a real step forward for the hospitality sector, fashion and other retail businesses, whicho need more than just a POS system. The ST-60-C5 offers the same successful compact and spill-proof design as its predecessor (ST-60) but with much more power and options. The ST-60-C5 supports the whole range of Microsoft Windows operating systems, including Windows®98, Windows NT®, Windows®2000 and Windows®XP. The super-bright TFT screen can be viewed from almost any angle, which, with the screen tilt angle of 0-90° and smooth touch functionality with optional tone makes the ST-60-C5 one of the easiest-to-use POS terminals on the market. 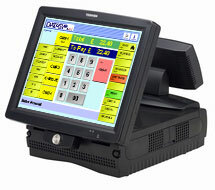 The ST-70 has been designed for the hostile hospitality and retail markets. There is no need for any cooling fans. This provides silent operation so the only sound to be heard is the sound of the customers. Combine this with Toshiba TEC’s legendary build quality and knowledge of the market place and the result is an ideal POS device for any environment. The touch screen and front panel are sealed together for a spill-proof design. The machine does not need vent holes, therefore, no dirt or undesirable foreign objects can enter it. The ST-70 stays clean inside, providing even better reliability. The ST-70 supports Windows®2000 and Windows®XP. TOSHIBA TEC has a well-established reputation as a leading manufacturer of quality and innovative POS systems, resulting in products that provide functionality, reliability and miniaturization, which is so important to both the retail and specialty industries. With this in mind the ST-7000 offers the leading-edge product in a compact design, with flexibility and a low total cost of ownership. The ST-7000 is equipped with a high performance processor, embedded to give efficiency and reliability and a 32-bit PCI thus accelerating response time, while its high capacity memory of up to 2GB reduces paging - two features, which help to eliminate bottlenecks. For essential maintenance the hard disk and engine block are accessible with security key lock. Replacement of the hard disk via the front panel is achievable in only a few seconds. Easy connection and disconnection of peripheral devices is possible, via the external interfaces, located at the rear of the machine.